Not all sand dunes are the same; they vary in size and shape. Crescentic, linear and star are the three basic dune forms. All other types of sand dunes are a subset of one of the three. Crescentic or crescent dunes, shaped like the new moon, are the most common type of sand dune. Crescentic dunes are usually wider than they are long and they are formed by winds that blow in the same direction day after day. And they are one of the fastest moving sand dunes. Crescentic dunes can move as much as 100 meters in a single year! Linear Dunes are long, snake-like ridges that run parallel to one another. In contrast to crescentic dunes, linear dunes are longer than they are wide. The longest known linear dune measures more than 160 kilometers! 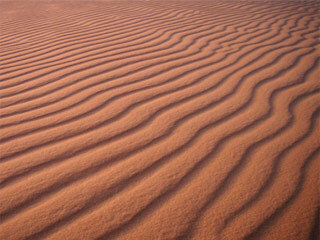 Yet like crescentic dunes, linear dunes are formed by winds that blow in the same direction all the time. What's more, they migrate too. Star dunes, shaped like starfish, have a central peak and multiple arms. These sand mounds, up to 500 meters tall, are formed by winds that blow in many directions over the course of a year. In contrast to crescentic and linear dunes, they grow upward rather than sideways. But they have one thing in common with the other two. Believe it or not these giant sand mountains move.